American Made Cleaners, Inc.'s long standing mission is protecting our environment and conserving energy by manufacturing the most efficient products with consistent quality and unmatched design simplicity. 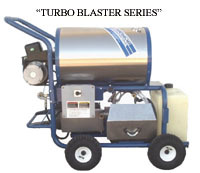 In keeping with our mission, our pressure washer design theory is based on environmental and energy conservation needs. Because of this, every component of our products addresses individual needs so the total machine meets the demands of today's market. Coil Design: We designed and built the machine to make heating coils that are 87% efficient. We contend when the coil design is right, the unit lasts longer, works better and makes for happier users. Our design has lower, safer stack temperature and burns less fuel than comparable machines on the market. The cold water wrap (outer layer of pipe) absorbs the heat others lose through insulation and heat shields. The preheated water contributes to the high efficiency. Our coil works equally well whether fired with natural or propane gas or diesel (#1 or #2) oil. Kerosene can be substituted. Our coils also work well in other brands. Schedule 40 and 80 material is used depending on use and is covered by our 3 year limited warranty. Temperature rise is 150 degrees above ambient. Special temperatures available by separate order. Oil Burners: are high pressure atomizing with automatic ignition and burn #1 and #2 diesel plus kerosene. The burners operate equally well on voltages of 12vdc, 120vac, 240vac and pulley driven. Gas Burners: are for use with natural or propane gas. Automatic ignition is standard unless otherwise specified. Burners: are controlled by manual switch, flow sensor and adjustable temperature control.